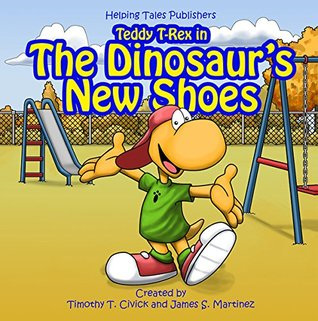 James S. Martinez has written a delightful book, The Dinosaur’s New Shoes, which will instill compassion, friendship and how to confront a bully into your discussions with your children. The rhyming lyrics are accompanied by vivid, colorful illustrations by the very talented Timothy T. Civick. The dinosaur theme they use is perfect, since all children love dinosaurs. I think Teddy will become a household favorite children will love to emulate. This book needs a very special place in your child’s library. In Mr. Martinez’s story, Teddy is on his way to the first day of school. He is excited to be able to show his new shoes to his friends. They are very excited for him. Then they meet a new boy who has old shoes. The new boy is teased by Bruno the Bully. “Being a bully is not cool. You will love reading this book to your children as Mr. Martinez tells how to handle a bully. It will help you discuss how to handle a bully with your child and it shows the way to become friends with someone who has been hurt by a bully. The author provides lists to help recognize bullies and who might be bullied. He also offers a list of sites where you and your children can learn more about bullying. You can help charities by buying books from Helping Tales Publishers as a part of each book sold is donated to charities that help those in need. James S. Martinez was born in Puerto Rico. He attended Kent State University and was awarded an MS in Biomedical Sciences in 2001. Through Helping Tales Publishers, Mr. Martinez and Mr. Civick are committed to making reading have a positive impact on the world by “helping those in need, one story at a time”.